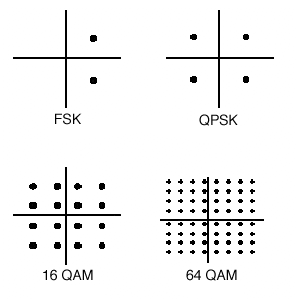 What is a QAM Signal Quadrature Amplitude Modulation (QAM) uses many different phases known as states: 16, 32, 64, and 256. Each state is defined by a specific amplitude and phase. This means the generation and detection of symbols is more complex than a simple phase or amplitude device. Each time the number of states per symbol is increased the total data and bandwidth increases. The modulation schemes shown occupy the same bandwidth (after filtering), but have varying efficiencies (in theory at least). 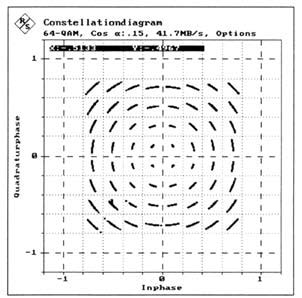 QAM — Constellation Diagrams Constellation diagrams are used to graphically represent the quality and distortion of a digital signal. In practice, there is always a combination of modulation errors that may be difficult to separate and identify, as such, it is recommended to evaluate the measured constellation diagrams using mathematical and statistically methods. 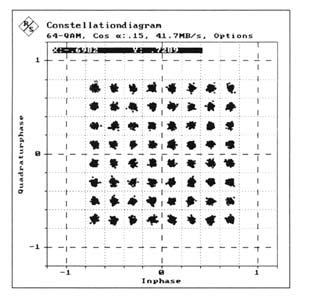 The following section will provide application and interpretation information of constellation diagrams of digital modulated signals. Amplitude Imbalance describes the different gains of the I and Q components of a signal. In a constellation diagram, amplitude imbalance shows by one signal component being expanded and the other one being compressed. 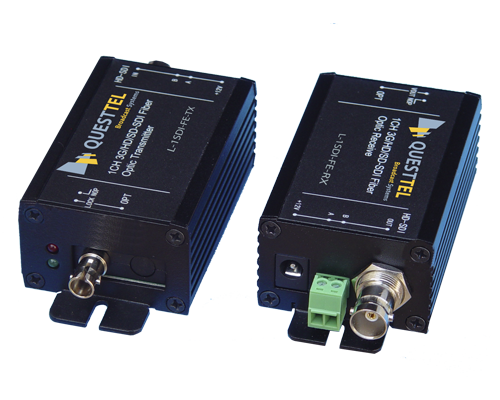 This is due to the fact that the receiver AGC makes a constant average signal level. Phase Error is the difference between the phase angles of the I and Q components referred to 90°. 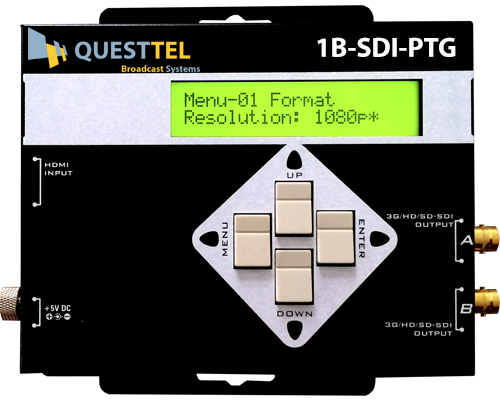 A phase error is caused by an error of the phase shifter of the I/Q modulator. The I and Q components are in this case not orthogonal to each other after demodulation. Interferers are understood to be sinusoidal spurious signals occurring in the transmission frequency range and superimposed on the QAM signal at some point in the transmission path. 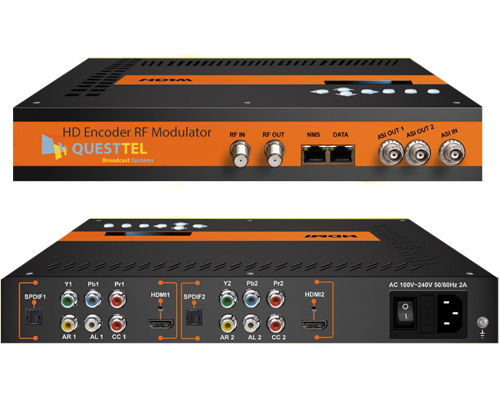 After demodulation, the interferer is contained in the baseband form of low-frequency sinusoidal spurious signals. The frequency of these signals corresponds to the difference between the frequency of the original sinusoidal interference and the carrier frequency in the RF band. Carrier suppression or leakage is a special type of interference in which it’s frequency equals the carrier frequency in the RF channel. 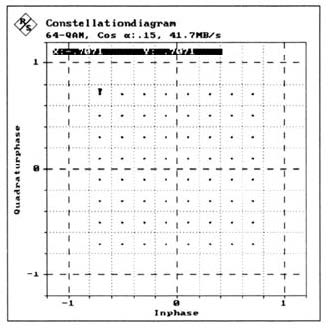 Carrier leakage can be superimposed on the QAM signal in the I/Q modulator. 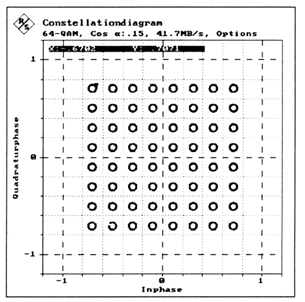 In the constellation diagram, carrier leakage shows up as a shifting of the signal states corresponding to the DC components of the I and Q components.